Data on different therapeutic classes of pharmaceutical compounds (PhCs) in clams or other bivalves living in natural conditions are scarce. 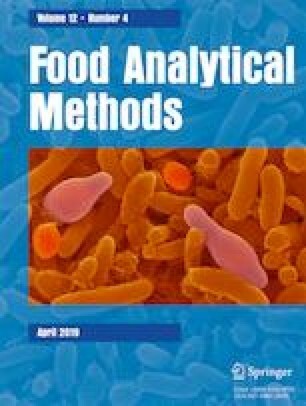 The aim of this work was the optimization and validation of a method for the determination of PhCs in clams for further evaluation of any potential human exposure risk due to their consumption. A quick, easy, cheap, effective, rugged, and safe (QuEChERS) approach is proposed for sample clean-up and concentration of 24 PhCs in clams, with subsequent analysis by liquid chromatography-tandem mass spectrometry. This method showed a good linear range for all PhCs with determination coefficients (r2) between 0.9949 and 0.9993 and coefficients of variation (CVm) lower than 5.5%. This method allowed the quantification of target compounds at trace concentration levels (ng g−1), being the most abundant PhC in clam caffeine. This PhC was detected in more than 70% of samples with concentrations ranging from 0.10 to 12 ng g−1 wet weight. The online version of this article ( https://doi.org/10.1007/s12161-018-01418-y) contains supplementary material, which is available to authorized users. The authors would like to thank the financial support from the project co-funded by the European Commission, LIFE Environment Programme, “LIFE Impetus - Improving current barriers for controlling pharmaceutical compounds in urban wastewater treatment plants” (LIFE14 ENV/PT/000739). João Rodrigues declares that he has no conflict of interest. Stephanie Albino declares that she has no conflict of interest. Sofia Silva declares that she has no conflict of interest. Alexandra Cravo declares that she has no conflict of interest. Vitor Cardoso declares that he has no conflict of interest. Maria João Benoliel declares that she has no conflict of interest. Cristina Almeida declares that she has no conflict of interest.